Fish curry in tamarind sauce is a very tangy recipe and popularly known as the Chapala pulusu in Andhra Pradesh state of India. 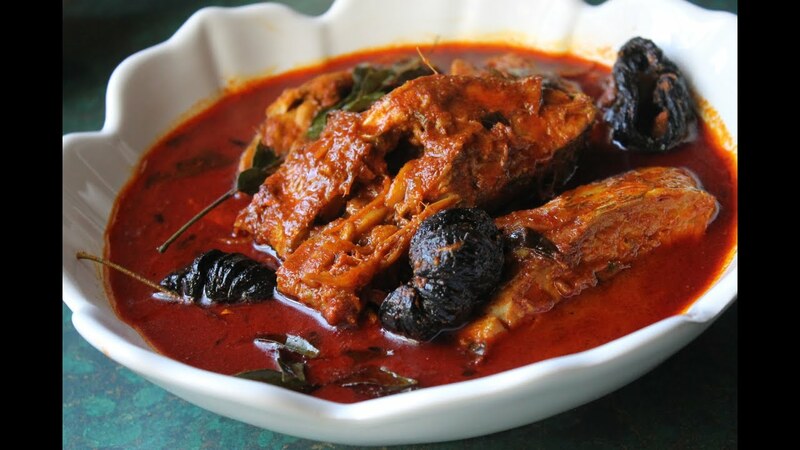 Andhra style fish curry is well blended with tamarind juice and other spices. Fish in tamarind sauce is quiet a spicy and tangy fish curry and one of the best fish recipes. It is also called as Meen Kozhambu in the Tamil Nadu and Kerala states of India especially the coastal regions. The Fish curry in tamarind sauce is one of the fine dishes that can be prepared for parties as the taste of the fish enhances after some hours of cooking the curry or the next day. By this the fish pieces are nicely soaked and the spiciness and sourness along with the natural sweetness from tamarind are thoroughly induced in every piece of the fish. It is one of the most admired and wonderful dish for all the non-vegetarians especially people who adore eating fish. There are a variety of fishes that be cooked but for this recipe the Korameenu or Black sole is the best and tasty. Fish curry in tamarind sauce in cooked combined with paste of browned onions (red or white but shallots are the best and enhances the taste of the curry) and nicely roasted spices like the sesame seeds, fenugreek seeds and coconut powder. It’s an awesome feast for all ardent seafood lovers. The Chapala pulusu is an authentic seafood delicacy popular and spread over the World from Nellore district in Andhra Pradesh. During mango season, they add the raw mangoes in this dish to give an extra zing to the sweet and sour sauce. To prepare the Fish curry in tamarind sauce, firstly roast the fenugreek seeds, sesame seeds and coconut powder nicely and grind to a fine powder. Keep it aside. Fry onions till they turn slightly brown. Make a fine paste of the spices mixture and the onions. In a wide open pan, add little oil, add mustard seeds, cumin seeds and when they crackle add curry leaves and green chilies. Add ginger garlic paste and fry till the raw flavor goes and add the onions and spices paste and mix thoroughly. Add a little water and mix well. Add coriander powder, cumin powder, chili powder and tamarind juice and cook. Bring this mixture to a boil till slightly traces of oil are floating on top. Add fish pieces and simmer the flame and cook. Do not stir the curry or else the fish pieces would break. Finish off with fresh coriander leaves and a little garam masala. It tastes really delicious with steam rice, chapatti, naan or dosai. Tip to remember: Do not stir too much lest the fish pieces break and be gentle while stirring the fish pieces. Serve it after a couple of hours of cooking so that the fish pieces absorb the tangy flavor of the tamarind sauce and spices. Generally we dry roast the coriander seeds, cumin seeds and dry red chilies and make a powder for this dish. You can also use the readymade powder. But it would be best to dry roast fresh spices and make a powder. Try this recipe and enjoy the tanginess of the fish curry. Fish is a highly nutritious food. Being an excellent protein food with fewer calories, it is better than other meat sources. It is rich in omega 3 fatty acids proven to be good for the heart. Fish are an excellent source of high quality protein. The biological value of fish protein is 80. They are low in fat particularly cholesterol & saturated. They are rich in calcium, particularly small fishes eaten with bones. Canned fishes are very rich in calcium since during processing they become soft to be eaten. Additionally marine fishes are good sources of iodine. Being low in sodium they are sufficiently rich in potassium. Fish liver oils are excellent sources of fat soluble vitamins. Rohu (Indian fish) contains Vitamin C. They are also good sources of vitamin D and niacin. There are a variety of ways to cook fish. Talking from the health point of view the best ways are baking, shallow frying, grilling, poaching and steaming. I am sure this dish will be greed up your palates and vouch for more. Heat oil, add mustard , cumin curry leaves gr chili, ginger garlic paste cook and add the paste of the ground spices.